Nonadaptive trees have all leaves on the same (last) level. Adaptive trees differ from nonadaptive trees in that they may have leaves on more than one level. Adaptive trees have the option of being level-restricted: in a level-restricted tree, neighboring leaves differ by at most one level. All trees returned by the tree builder are pruned so that empty leaves have been removed. If a level-restricted tree is requested, the tree gets constructed in such a way that the version of the tree before pruning is also level-restricted. Constants for box flags bit field. A quad/octree consisting of particles sorted into a hierarchy of boxes. Optionally, particles may be designated ‘sources’ and ‘targets’. They may also be assigned radii which restrict the minimum size of the box into which they may be sorted. Instances of this class are not constructed directly. They are returned by TreeBuilder.__call__(). Unless otherwise indicated, all bulk data in this data structure is stored in a pyopencl.array.Array. See also get(). A scalar used for calculating how much particles with extent may overextend their containing box. Each box in the tree can be thought of as being surrounded by a fictitious box whose \(l^\infty\) radius is 1 + stick_out_factor larger. Particles with extent are allowed to extend inside (a) the ficitious box or (b) a disk surrounding the fictious box, depending on extent_norm. One of None, "l2" or "linf". If None, particles do not have extent. If not None, indicates the norm with which extent-bearing particles are determined to lie ‘inside’ a box, taking into account the box’s stick_out_factor. 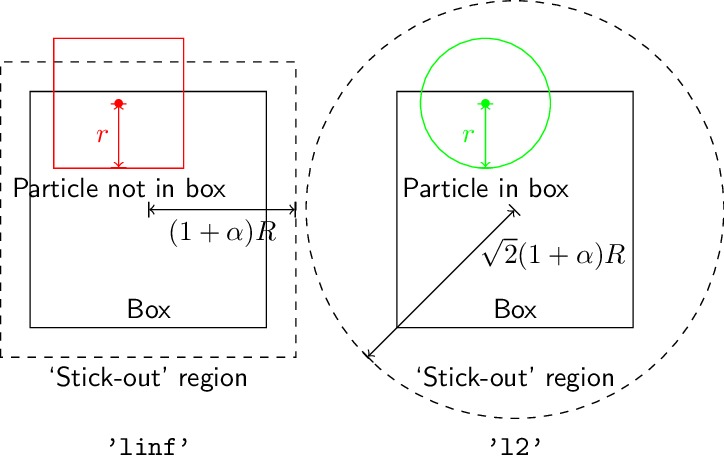 In the figure, the box has (\(\ell^\infty\)) radius \(R\), the particle has radius \(r\), and stick_out_factor is denoted \(\alpha\). a tuple (bbox_min, bbox_max) of numpy vectors giving the (built) extent of the tree. Note that this may be slightly larger than what is required to contain all particles. A numpy.ndarray of box ids indicating the ID at which each level starts. Levels are contiguous in box ID space. To determine how many boxes there are in each level, access the start of the next level. This array is built so that this works even for the last level. The same array as level_start_box_nrs as a pyopencl.array.Array. Stored in tree source order. May be the same array as targets. coord_t [nsources] \(l^\infty\) radii of the sources. Available if sources_have_extent is True. Stored in tree target order. May be the same array as sources. \(l^\infty\) radii of the targets. Available if targets_have_extent is True. Fetching from these indices will reorder the sources from user source order into tree source order. Fetching from these indices will reorder the targets from tree target order into user target order. List of sources in each box. Records start indices in sources for each box. Use together with box_source_counts_nonchild or box_source_counts_cumul. May be the same array as box_target_starts. List of sources in each box. Records number of sources from sources in each box (excluding those belonging to child boxes). Use together with box_source_starts. May be the same array as box_target_counts_nonchild. List of sources in each box. Records number of sources from sources in each box and its children. Use together with box_source_starts. May be the same array as box_target_counts_cumul. List of targets in each box. Records start indices in targets for each box. Use together with box_target_counts_nonchild or box_target_counts_cumul. May be the same array as box_source_starts. List of targets in each box. Records number of targets from targets in each box (excluding those belonging to child boxes). Use together with box_target_starts. May be the same array as box_source_counts_nonchild. List of targets in each box. Records number of targets from targets in each box and its children. Use together with box_target_starts. May be the same array as box_source_counts_cumul. Box 0 (the root) has 0 as its parent. “0” is used as a ‘no child’ marker, as the root box can never occur as any box’s child. A bitwise combination of box_flags_enum constants. In this boxtree.Tree subclass, the sources of the original tree are linked with extent are expanded into point sources which are linked to the extent-having sources in the original tree. (In an FMM context, they may stand in for the ‘underlying’ source for the purpose of the far-field calculation.) Has all the same attributes as Tree. Tree.sources_have_extent is always True for instances of this type. In addition, the following attributes are available. Stored in tree point source order. Fetching from these indices will reorder the sources from user point source order into tree point source order. Construction: Requires that Tree.sources_have_extent is True on tree. point_source_starts[isrc] and point_source_starts[isrc+1] together indicate a ranges of point particle indices in point_sources which will be linked to the original (extent-having) source number isrc. isrc is in user source order. All the particles linked to isrc shoud fall within the \(l^\infty\) ‘circle’ around particle number isrc with the radius drawn from source_radii. point_sources – an object array of (XYZ) point coordinate arrays. Use ParticleListFilter.filter_target_lists_in_user_order() to create instances of this class. This class represents subsets of the list of targets in each box (as given by boxtree.Tree.box_target_starts and boxtree.Tree.box_target_counts_cumul). This subset is specified by an array of flags in user target order. The list consists of target numbers in user target order. See also FilteredTargetListsInTreeOrder. Filtered list of targets in each box. Records start indices in boxtree.Tree.targets for each box. Use together with target_lists. The lists for each box are contiguous, so that target_starts[ibox+1] records the end of the target list for ibox. Filtered list of targets in each box. Records number of targets from boxtree.Tree.targets in each box (excluding those belonging to child boxes). Use together with target_starts. Target numbers are stored in user order, as the class name suggests. Use ParticleListFilter.filter_target_lists_in_tree_order() to create instances of this class. This class represents subsets of the list of targets in each box (as given by boxtree.Tree.box_target_starts and boxtree.Tree.box_target_counts_cumul).This subset is specified by an array of flags in user target order. Unlike FilteredTargetListsInUserOrder, this does not create a CSR-like list of targets, but instead creates a new numbering of targets that only counts the filtered targets. This allows all targets in a box to be placed consecutively, which is intended to help traversal performance. Filtered list of targets in each box, like boxtree.Tree.box_target_starts. Records start indices in targets for each box. Use together with box_target_counts_nonchild. Filtered list of targets in each box, like boxtree.Tree.box_target_counts_nonchild. Records number of sources from targets in each box (excluding those belonging to child boxes). Use together with box_target_starts. Storing to these indices will reorder the targets from filtered tree target order into ‘regular’ tree target order. flags – an array of length boxtree.Tree.ntargets of numpy.int8 objects, which indicate by being zero that the corresponding target (in user target order) is not part of the filtered list, or by being nonzero that it is. particles – an object array of (XYZ) point coordinate arrays. ’adaptive’ requests an adaptive tree without level restriction. See Supported tree kinds for further explanation. targets – an object array of (XYZ) point coordinate arrays or None. If None, particles act as targets, too. Must have the same (inner) dtype as particles. If not None, a pyopencl.array.Array of the same dtype as particles. If this is given, targets must also be given, i.e. sources and targets must be separate. See Sources and targets with extent. target_radii – Like source_radii, but for targets. stick_out_factor – See Tree.stick_out_factor and Sources and targets with extent. refine_weights – If not None, a pyopencl.array.Array of the type numpy.int32. A box will be split if it has a cumulative refine_weight greater than max_leaf_refine_weight. If this is given, max_leaf_refine_weight must also be given and max_particles_in_box must be None. max_leaf_refine_weight – If not None, specifies the maximum weight of a leaf box. max_particles_in_box – If not None, specifies the maximum number of particles in a leaf box. If this is given, both refine_weights and max_leaf_refine_weight must be None. extent_norm – "l2" or "linf". Indicates the norm with respect to which particle stick-out is measured. See Tree.extent_norm. in its corresponding axis direction. (Internal use only) of the same type as returned by boxtree.bounding_box.make_bounding_box_dtype. When given, this bounding box is used for tree building. Otherwise, the bounding box is determined from particles in such a way that it is square and is slightly larger at the top (so that scaled coordinates are always < 1). When supplied, the bounding box must be square and have all the particles in its closure. kwargs – Used internally for debugging. a tuple (tree, event), where tree is an instance of Tree, and event is a pyopencl.Event for dependency management.